Recently I have been wanting to do some wide-field imaging, and so acquired a TeleVue NP-101. To leverage my existing equipment as much as possible (i.e., not buy a new mount), I sought a way to use the 10" LX200GPS as the mount for the NP-101. The key was not so much the weight involved, as the NP-101 only comes in at about 10 pounds. Rather, the hard part was getting the setup balanced in both the R.A. and declination axes. Balance is critical for good autoguiding performance, and probably also for the longevity of the mount's motors and gear trains. I made use of the Losmandy dovetail system both to mount the NP-101 on the top of the LX200, and to attach adjustable weights to the bottom of the OTA. Each of the weights under the OTA weighs 5 pounds. A total of three of these were needed to balance the NP-101 and mounting hardware plus the focuser and the rather hefty ST-10XME CCD camera mounted at the rear. The weights are adjustable in two axes. They can be moved fore and aft by sliding along the dovetail mounting plate. Also, the weights are threaded, so the leverage (distance from the OTA) can be adjusted by screwing them in or out. 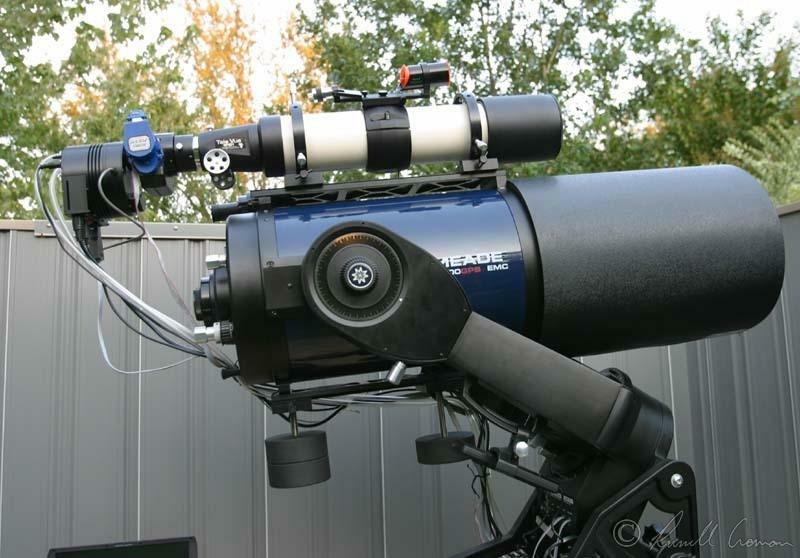 They easily clear the mount's base when the scope is pointed skyward. In the setup shown, the scope is perfectly dynamically balanced in both axes. That is, it will stay balanced in both the R.A. and declination axes no matter where I point it in the sky. This much harder to achieve than static balance, wherein the scope will be balanced for one orientation, but go out of balance if it is pointed elsewhere. Another concern I had was the additional stress that would be placed on the motors and gears when the scope slews. Since it is balanced, there is no particular increase in motor/gear load when simply tracking at the sidereal rate. But when the scope starts or stops a fast slew, there is now a lot more mass to get moving or to stop, and this does place additional stress on the system. To address this, I changed the "max slew rate" setting in the LX200's AutoStar controller to 2 degrees per second, instead of the default 8 degrees per second. If you look closely, you'll notice that I also re-used the modified LX200GPS microfocuser/RoboFocus unit so I can automatically focus the NP-101. There are a number of factors which must be correct for good guiding with the LX200GPS. Probably most of these apply to other mount systems as well. Note that only one of these items is periodic error correction (PEC). The mount must be balanced for good guiding. A heavy imbalance seems to cause erratic behavior of the axis in question. With perfect polar alignment, I suppose only the R.A. axis would need to be balanced, but this not very practical. Also, the balance should be dynamic, which is to say that the scope should remain balanced no matter where you point it in the sky. This is much harder to achieve than mere static balance, where the scope is balanced in one orientation but will slowly go out of balance as it tracks the sidereal motion. Finally, there should be just a bit of imbalance in the system, weighting the R.A. axis to the east and the declination axis in either direction. This keeps a bit of load on the gears, always in one direction, and improves guiding behavior. Both axes should be mechanically adjusted for minimum backlash. Don't use electronic backlash compensation, as the small jump that occurs when the motors reverse directions can cause a guiding error. Sub-sidereal guiding rate on R.A. The guide rate on the R.A. axis should be set to something lower than the sidereal rate. This way the motor never has to reverse direction or stop to make a guide correction; it simply runs slightly slower for a short time and lets the star "catch up" to where it is supposed to be. The mount should have nothing dragging on it or dangling from it that might interfere with its motion. I made the mistake once of routing my camera cables and cooling hoses through one of the fork arm handles. In some orientations, the cables were under slight tension, and as the scope tracked, they would occasionally slip ever so slightly. This was enough of a perturbation to cause up to a five arcsecond jump in R.A., ruining the exposure. Cables must be arranged so that they don't unduly hang on the scope, but also so they do not encumber its motion. For long-exposure, high-resolution work on the LX200GPS, a tip-tilt adaptive optics unit unfortunately seems to be an absolute necessity. I use the SBIG AO-7 with good success. The update rate must be above 2Hz or so to keep up with the mount errors. Having PEC turned on and well-trained seems to help here.